Air conditioning | ventilation systems. 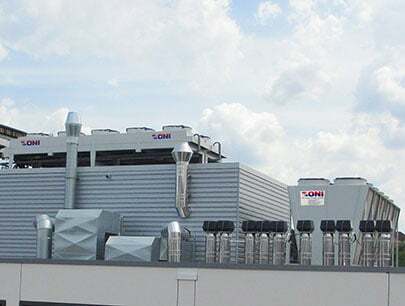 In any case, our concepts take into account the most energy-saving operation possible, whereby the required air quality has the highest priority. For example, large amounts of energy can be saved by using ONI heat recovery systems. Waste heat from production machines or other cooling circuits is used as heating energy to preheat fresh air. Holistic room air concepts from ONI thus ensure a good climate with low operating costs. The achievable savings result, for example, from a demand-oriented system selection, the use of energy-saving components, heat recovery or optimised air distribution. ONI has therefore specialised in the planning and construction of particularly energy-efficient ventilation systems and cleanroom technology. We offer a comprehensive range of products and services from simple aeration and ventilation to controlled aeration and air-conditioning in sections to cleanroom technology for the highest demands in the fields of medical technology, plastics processing, the food, packaging and printing industries. 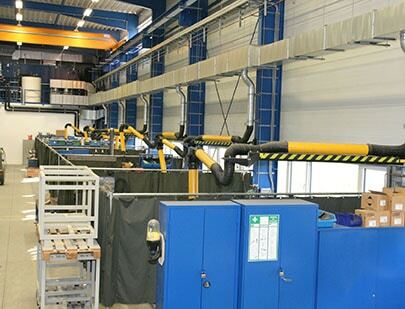 Adapted to the respective requirement, we offer the corresponding system solution for air volume flows of 500 to 500,000 cubic metres per hour. Hygiene requirements have the highest priority during the planning, construction, manufacture, erection and operation, including the maintenance of ventilation and air-conditioning systems! For this reason, regulations and guidelines require that particularly qualified, experienced and trained specialists are employed when it comes to ventilation and air-conditioning systems. Since we are aware of the special responsibility in this sensitive area, the employees of the HVAC department have been trained in accordance with VDI 6022. The qualification of our company is certified by the certificate "Hygienefachbetrieb nach VDI 6022 A". Production safety and employee performance are strongly influenced by indoor air quality! More and more companies are recognising this problem, are looking for suitable ventilation systems, a competent system partner and ...are coming to us. This is due to our many years of experience in the planning and construction of ventilation systems for a wide variety of industrial sectors. In addition, we can guarantee that you will receive a system that meets your requirements and requires as little energy as possible. The energy consumption for the operation of ventilation systems in industrial plants is considerable. If, in addition, larger amounts of fresh air are required for the controlled supply air, the energy costs increase massively. The main reason for this is the continuously rising energy prices. More and more companies are therefore looking for ways to drastically reduce the operating costs of these systems. For the energetic evaluation we offer a free short check. We will be happy to advise you and inform you about possibilities for energy optimisation in your ventilation or clean room system.